A person can be afflicted with an allergy at any stage of their lives. Whereas someone may avoid a particular detergent or soap, dairy products or shellfish if they are allergic to them, a dog owner will often choose to live with their symptoms rather than give up their four-legged friend. If you find that you start to suffer from sneezing, a runny or itchy nose, watery eyes, a sore throat or skin rashes when you’re around your dog, there’s a good chance that you have developed an intolerance to him. This can be confirmed by a visit to your GP, who can arrange for you to undergo test to determine the source of your allergy. It’s unlikely that an owner will swap their pet for a breed that is allergy friendly, but there are several measures that you can take to minimise the onset of your symptoms. First and foremost is cleanliness. Dog allergens will be found on furniture, walls, curtains and clothing, and can remain airborne for some time. Don’t allow your pet to sleep or play on any furniture that you will be using. Dander can gather here, and can cause a severe reaction. It’s essential to ensure that your house is cleaned regularly. Shampoo or steam clean your carpet every other month or so, and try to keep your floors vacuumed and your furniture and curtains clean. It may help to get your carpets and curtains cleaned by a professional carpet cleaning company. Washing your dog’s toys and bedding regularly can also help. Be sure to wash your hands after grooming or playing with your dog. Taking allergy medication before playtime can help, as can changing your clothes afterwards. A good quality HEPA air filter can help eliminate airborne dander, but only if you groom your dog on a regular basis. Bathing your dog once a week can help, but care must be taken to rinse him thoroughly, as shampoo that dries on his skin can cause worse dander. Even if you adhere to a strict regime of cleanliness, you may still suffer. However, if you have an allergy but would still like to own a dog, there are several breeds that shed less skin than others, making them a better prospect. 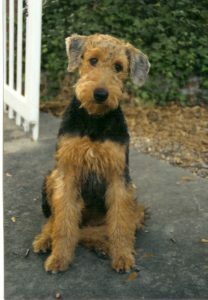 A medium to large breed, Airedales are playful and can adapt easily to either the garden or yard, making them ideal for an allergy sufferer who would not want their pet indoors all day long. Care must be taken with grooming, and it must be performed by a professional; their hair needs to be plucked. Failure to do so can lead to skin irritation, rashes and more dander. Poodles can be an excellent choice for allergy sufferers. As well as having a wide choice in the size of dog, they don’t shed and their coat can be clipped quite close to their skin. This makes bathing and grooming him less of a chore, as long as he does not have a ‘lion mane’. 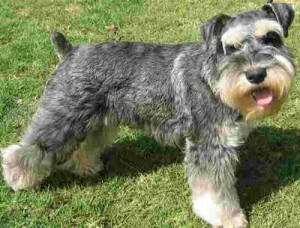 Like poodles, schnauzers come in a range of sizes and do not shed hair. Although his hair can be closely trimmed, you may wish to keep his trademark ‘beard’. There are many other breeds that could be suitable for those with a dog allergy. Longer haired types include the shih-tzu, the Bolognese and the Spanish Haired water dog. If you don’t want to take any chances, there are several breeds available that do not have a coat; the American Hairless Terrier and the Hairless Khala are completely bald, as are the exotic Peruvian Inca Orchid and Xoloitzcuintli. However severe your allergy, taking the proper steps can ensure you can indulge your love of dogs. I have a Miniature Schnauzer and an allergy. My doctor recommended this breed to me because it sheds very little and little or no oil and dander. So I would also recommend it to allergy sufferers.